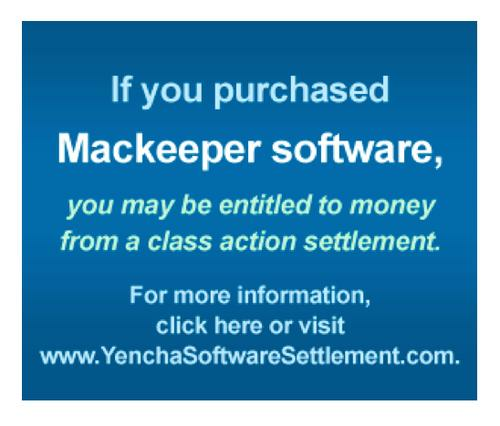 A large Internet advertising campaign is planned to alert those who bought MacKeeper of a class-action settlement. MacKeeper's developer, ZeoBit, was sued in May 2014 in U.S. District Court for the Western District of Pennsylvania. Filed on behalf of Pennsylvania resident Holly Yencha, the class-action suit alleges MacKeeper was deceptively marketed and did not fully function as advertised. Under a proposed settlement, ZeoBit -- a company started in Ukraine but now based in California -- will put US$2 million into a fund to reimburse customers but admit no fault, which is customary in class-action settlements. Once the settlement has preliminary approval from Judge Joy Flowers Conti, those who bought MacKeeper will be contacted by email. In case some of those email addresses are invalid, an Internet advertising campaign is planned as well as a website. Rust Consulting, the company contracted to administer the settlement, plans to buy 16 million ad impressions through providers such as Xasis, an advertising platform, and Facebook. Court documents show 513,330 people bought MacKeeper in the U.S. alone. At $39.95 per copy, ZeoBit would have made as much as $20.4 million in revenue. If everyone who bought MacKeeper files a claim, the reimbursement amount will be small. About one-third of the settlement will go to the attorneys who filed the suit, with the remainder to claimants after other administrative fees are deducted. A transcript of an April 16 hearing in the case shows some of the economics of class-action suits. Judge Conti pointed out that someone filing a claim "might be lucky to receive maybe $3" based on a $2 million settlement. Rafey Balabanian, an attorney for the plaintiff with the law firm Edelson PC, told Conti that claim rates for similar class-action suits range around just 1 to 2 percent. "It's unfortunately not easy to get people to move and make a claim for something less than $50 or even $30 honestly, your honor," Balabanian said. "It's just the nature of consumer class actions." Based on those historical claim rates, "I'm quite confident people will be getting their full purchase price" for MacKeeper, Balabanian said. If more than about 33,500 people apply for a refund, however, the refund value will proportionally fall from $39.95. That figure is based on subtracting 33 percent of the $2 million settlement for attorney fees and dividing the remainder by the full cost of MacKeeper. Once the settlement is preliminarily approved by Conti, an online notice will be published at www.yenchasoftwaresettlement.com. Those who are eligible for a payment can exclude themselves or file an objection with the court. Payments are dependent on final approval of the settlement by Conti, according to a court document. In April 2013, ZeoBit sold MacKeeper to a company called Kromtech Alliance Corp., which lists its headquarters as Cologne, Germany. Kromtech, which has continued to aggressively market MacKeeper, isn't listed as a released party in the settlement, which means it could be sued. In an interview with IDG News Service last month, a Kromtech spokesman defended MacKeeper despite reviews by security experts who say it warns of performance problems on brand-new Apple machines.